The UNIST Graduate School of Technology and Innovation Management (GSTIM) will begin recruiting new graduate students. The application process for 2018 first half admission begins on October 17th and ends on November 9th, 2017. 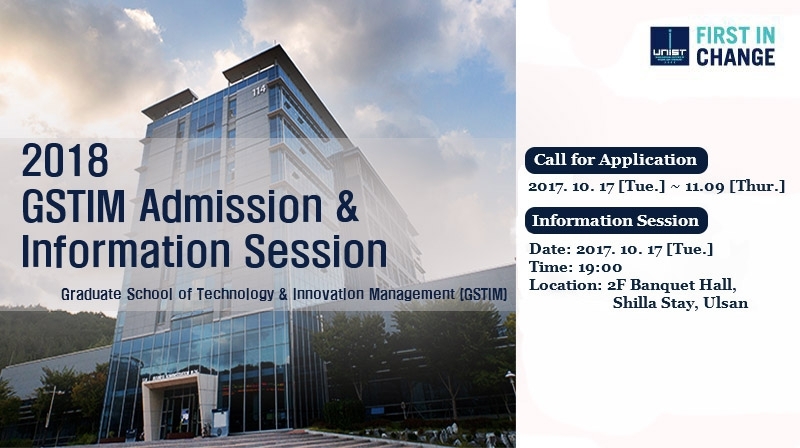 Prior to the date of receiving applications, GSTIM will also host an information session for prospective students and their families on Tuesday, October 17, 2017. The information sessions are conducted in a question and answer format, in which prospective students may inquire about the Graduate School of Technology and Innovation Management at UNIST. It is designed to help students navigate the application procedures, become informed on admission policies and gather information about available services, student life and living on campus. Established in 2016, GSTIM is committed to interdisciplinary education in the English-speaking environment, and to pioneering research across all their disciplines in order to cultivate competent leaders with a global perspective and an innovative capability to excel in the theory and practice of both business and technology management. Its curriculum consists of a set of three study tracks: “Innovation in Industry” aims to equip candidates with skills, needed to drive innovation within Manufacturing Industry using big data and IT technology, “Technology & Venture Commercialization” that offers courses in a range of topics related to new business ideas and hand-on experience with new business ventures, and “Strategic Technology Management”, which is a multi-disciplinary program that provides students with the opportunity to examine a wide range of topics from innovation to management. Besides, the courses offered by GSTIM faculty are both on part-time and full-time basis, allowing students to balance personal and professional obligations. These courses take a practical approach using real-world case studies to hone one’s skills in overseeing complex projects. If you have any questions regarding your visit to campus, please contact the GSTIM Admissions Office at 052-217-3172 or visit the website of GSTIM (mot.unist.ac.kr).